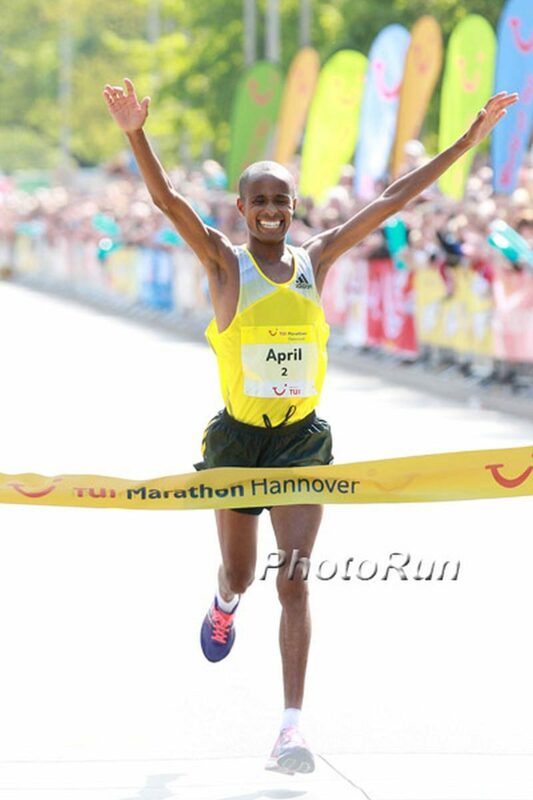 Despite warm weather conditions both course records were broken in the TUI Marathon Hannover: South Africa’s Lusapho April clocked 2:08:32 while Ukraine’s Olena Burkovska crossed the line in 2:27:07. While temperatures climbed to over 20 Celsius during the final part of the race both winners ran the second half faster than the first and improved their personal bests. Adding races at shorter distances a record total of around 16,000 athletes took part in the TUI Marathon Hannover. The event is an IAAF Bronze Label Race. The men’s race started with a much slower pace than planned. A 10 k split time of 30:54 indicated a finishing time of just under 2:11 – that was well off the targeted course record of 2:08:52. It was only after the 15 k mark when the pacemakers finally started to run according to schedule on the very flat Hannover course. 16 runners then passed the half way mark in 64:48 minutes. Four kilometres later Lusapho April made a serious attack with the help of pacemaker Frederick Ngeny (Kenya), who was originally scheduled to go only until half way. “I asked him if he could continue until 30 kilometres. That was very helpful and I thank him for that,” said Lusapho April. 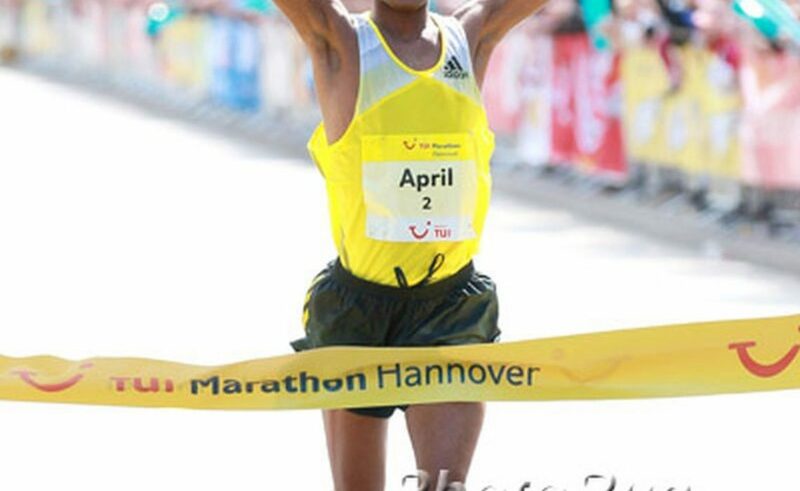 At 30 k (1:31:17) the 30 year-old, who had won the TUI Hannover Marathon in 2011 with a personal best of 2:09:25, was 39 seconds ahead of a group of four: Wesley Langat, David Kisang (both Kenya), Mekuant Ayenew and Samuel Getachew Demie (both Ethiopia). Defending champion Joseph Kiptum (Kenya) had already lost contact shortly before and later dropped out with a hip problem. For several kilometres it looked as if Wesley Langat (Kenya) might be able to catch Lusapho April, but in the later stages the Kenyan faded and finally had to be content with seventh place in 2:13:49. In contrast the South African continued to run strong despite very warm sunshine and increased the gap, although running alone for the final 12 k. “I was confident. And I knew I could break the course record,” Lusapho April later explained. “It was the first time in my career that I started a marathon race fully fit and without any problems,” said Lusapho April, who had been unlucky when he fell at the 30 k refreshment station during the Olympic Marathon in London. He then limped in the final lap and finished 43rd. As his coach Karen Zimmerman explained they decided to have a longer break after that and then started the build-up for Hannover. It was worth being patient for Lusapho April since he now has establisehd himself as South Africa’s number one marathon runner. It is four years ago that a runner from this nation has last run faster than Lusapho April today: Hendrik Ramaala clocked 2:07:44 in 2009. “With a faster pace in the first part of the race and in cooler conditions I could have run sub 2:08 today,” said Lusapho April. Such a time will be a next goal in the future. Luspaho April was more than one and a half minutes ahead of second placed Mekuant Ayenew (2:10:05). Fellow-Ethiopian Samuel Getachew Demie took third (2:12:38) while Kenyans Jonathan Yego (2:13:18), Isaac Arusei (2:13:23) and Wilfred Kigen ( 2:13:41) followed in fourth to sixth places. After a number of unsuccessful attempts by the organisers they finally got their first sub 2:30 performance in the women’s race. Olena Burkovska (Ukraine) improved the course record of 2:30:17 by more than three minutes with 2:27:07. The 31 year-old, who had a personal best of 2:28:31 from the Berlin Marathon 2010, passed the half way mark in 1:13:49. She was running together with Marta Megra (Ethiopia), debutant Edinah Kwambai and Agnes Cheserek (both Kenya). Megra then lost contact and when Burkovska increased the pace shortly before the 30 k mark (1:44:34) the other two could not cope. “At that point I knew that I would run a course record and a personal best. To break both records, that was my aim coming to Hannover,” said Olena Burkovska. Edinah Kwambai ran a fine debut in warm conditions with 2:29:49 and took second. Marta Megra was third in 2:31:05 while Agnes Cheserek was suffering in the final stages and clocked 2:39:36 for fourth.